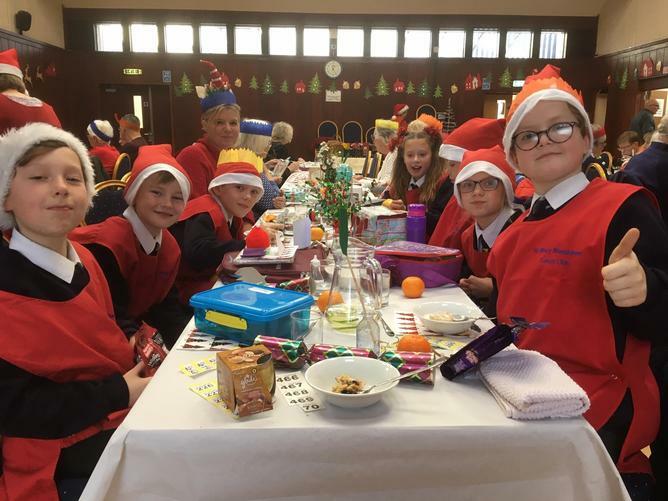 Some of our Year 6s had a trip out this week to Beare Green Village Hall where they helped to serve Christmas Dinner to the Monday Lunch Club. They gave out cards and satsumas to everyone, served the lunches, served cranberry and bread sauce, then cleared away plates and helped serve the puddings. They also tucked into their own lunches and enjoyed the wonderful festive feeling. Mrs Mansfield was ably helped by Mrs Tyson-Davies, our regular helper mummy, and a great time was had by all. The children, as always, were beautifully behaved and a credit to the school. We look forward to going back to the Monday Lunch Club once a month next year.